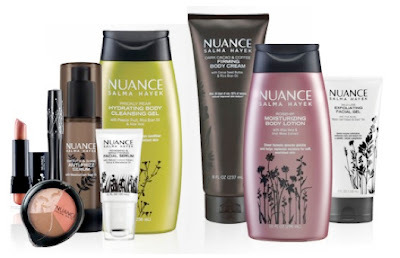 Well this is interesting, starting today you'll be able to buy Salma Hayek's new Nuance line at all CVS drugstores and at CVS.com. But wait, before you start rolling your eyes--this is a 100+ product line featuring skincare, haircare, body and cosmetics that were all inspired by Hayek's grandmother, who was a cosmetologist. Nuance combines the tradition of home-made beauty treatments in modern formulations. Some of the products include ingredients such as tepezcohuite (from Brazil), blue agave, and a lime enzyme that are making their debuts on the mass market. I think that the packaging is quite appealing, and if the packaging doesn't do it for you--maybe the price point will--The collection is priced from $2.99 to $19.99! hmmm..I think I might just have to pick a few products up on my next CVS run--what do you think? It's definitely worth a try for that price!